After I got back from Pabbay, there was only a few days before the West Highland Way race I had entered. I had spent most of the spring thinking there was no possibility whatsoever thatI’d be able to do it. My ankle had progressed a bit, then got worse, then much worse, then a bit better again. I’d get a few runs in for a couple of weeks, then have to stop for a few weeks, then attempt to start again. My total mileage from January to the start of June was only just double the length of the race. Oh dear. However, during June I did manage a couple of weeks running 60 miles a week, so that was better than nothing. I mostly did shorter runs because that’s all my foot would allow me to. The longest was only 25 miles. But I could do 10K in under 40 minutes so I was definitely better than couch potato standard. I figured that even if I could only run 40 or 50 miles, I’d walk in the rest and call it a success under the circumstances. However, on my last run before the race, I realised I was about to pay for trying to go from zero to fit in a few short weeks. The plantar fascia I tore in last year’s accident started to burn sharply and I knew it was over. Nevertheless, I showed up at the start line and ran the first 20 miles before limping into Balmaha, not leaving any doubt in my mind. I was upset. The experience has left a bigger scar in my mind than in my foot. Perhaps after another year, my foot will be in better form for running. At least I can give it a break and start from scratch again. The trouble with these sorts of experiences is that they are a storm in a tea cup. In one part of your mind, it's really pretty upsetting. End of a little dream and all that. But to everyone else, it's no big deal. Life goes on. Lucky to be alive after the accident anyway etc.. All true. I guess I just haven't grown up enough to deal with such little frustrations. The scary thing is, I don't always feel like I want to. So with that, my little diversion was consigned to the past, and two days later I was tied in at the foot of Conquistador E7 7a at the Loch Tollaidh crags. After a quick abseil brush and check of the gear, I decided to go for a flash attempt. I got through the initial boulder problem without any trouble. I felt pretty relaxed, and so I didn’t really notice the pump creeping in as I worked my way towards the second crux high on the route. This also went by without much trouble, but a sense of urgency suddenly hit me as I hung from a sloper trying to fiddle in a small RP. There were no footholds and so a bit of a grunt was required to pull over the final bulge into a face full of drizzle. The buzz was enough to clear some cobwebs and remind body and mind that it’s built for climbing steep rock. 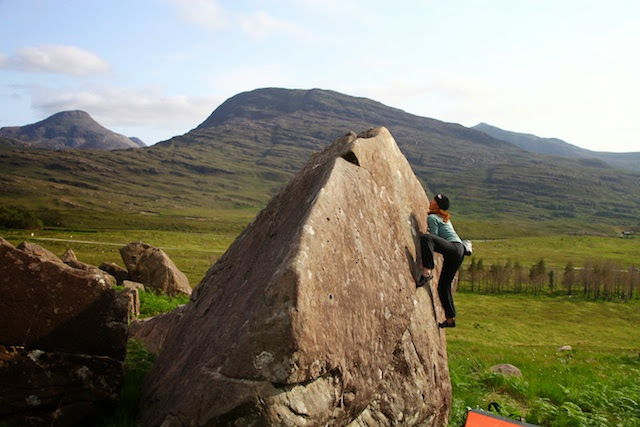 The following day myself and Alicia toured the lovely sandstone of Torridon and worked projects in the Arisaig Cave. 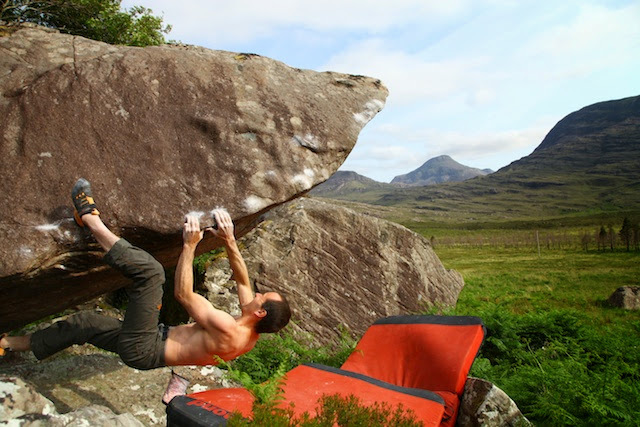 I went back just afterwards and found a kneebar which changed a Font 8a project into another classic 7Cish (it was pretty damp when I did it so maybe it’s be easier in fresh weather). After that, A period of three difficult weeks began. More about that in a separate post. 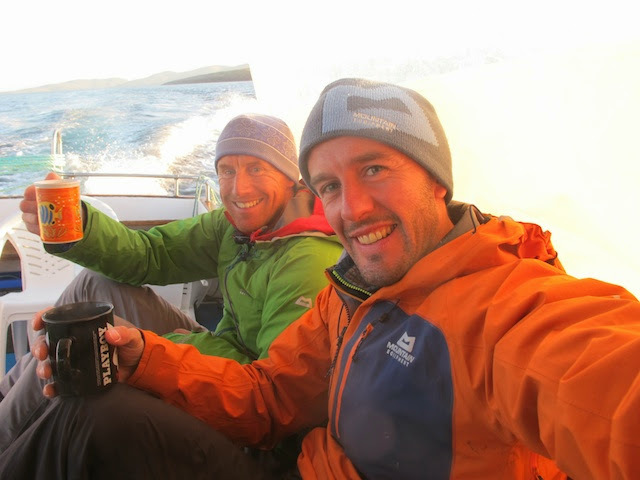 Donald King and myself, enjoying the boat ride back from Pabbay. The mugs were the boatman’s by the way. 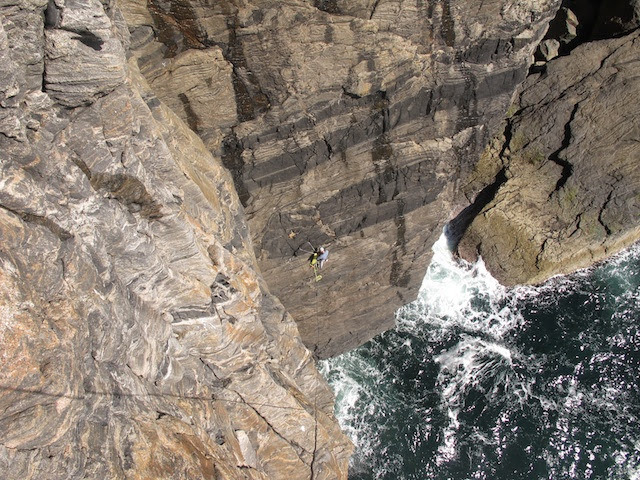 June is often a time to get on a boat and go and find some amazing new sea cliff climbs to be done in the Hebrides. I’ve been lucky to have done more than my fair share over the past ten years. Yet they just keep coming! One place I’d never yet been was Pabbay. The obvious target was the Great Arch project. The arch is of course the most striking and obvious challenge on the island. And like other lines of similar calibre such as the Longhope Route, it’s also going to be the hardest. Great! It was first tried by Cubby Cuthbertson and Lynn Hill while they were being filmed for a BBC TV programme in 1997. On that trip, the route didn’t go free although they did record it with a rest/aid point. With better weather and a bit more time, I’m sure they’d have done it. You don’t get a much stronger team that those two! Talking of strong teams, the next party to attempt it was Steve Mclure and Lucy Creamer a few years ago. Steve inspected the line on abseil and then made a great attempt to flash it, getting through the first crux. He fell in the roof, pulled back up to his highpoint on the rope and carried on to the end. He opted not to come back and make the free ascent. So, after all these years, it still needed doing. The projected grade I'd heard for the free ascent was E9 7a, but in the end E8 6c was more like it. That is a roof that needs climbing. I headed over with Donald King to see if we could do it. We had a good window of time to cope with the usual sea cliff problems of sea spray dampness and bad weather. So I was quite relaxed and excited about getting on it. On our first day I abseiled down the crux top pitch through the huge horizontal roof. It was totally damp with sea spray so all I could do that day was pull on and try a few individual moves in the roof on the GriGri and then do the first couple of wet pitches for something to do, abseiling off into the sea around midnight in fading light. Next day I waited until the evening to even go on it in the hope the sea spray might dry out a bit more. It was fortunately drier when I arrived. I went down and played about a bit more on the abseil rope for an hour or so and had that feeling that maybe I ought to stop there and have a good go at the whole route the next day (and last before a big rainy front arrived). On day three we were disappointed to find the dreaded sea spray hanging like a mist under the great arch. It was a roasting hot sunny day, but the route was dripping. All we could do was lie and sleep in the sun on the hot boulders at the base for four hours. Hard life eh? However, sunbathing was not what I traveled all that way for. So at around tea time, almost without speaking, we got ourselves together and just started going upwards. Pitches 1 and 2 round the first pitch flew by in minutes. The big third pitch was a grunt with still wet holds lurking in the big roof, but it also went fairly smoothly for both Donald and myself. The infamous offwidth slot of pitch 4 was only a few metres in length, but my first experience of ‘scapular walking’. I have no idea if that is a climbing technique, but it worked. Pitch 5 was the most gloriously exposed and finely positioned 5a pitch I’ve ever climbed. It was so relaxing. A cool breeze began to blow as I started it, and became more and more noticeable as I shuffled across the brilliant incut flakes of gneiss, a huge roof below my feet, another looming directly overhead. The roof of pitch 3 looming overhead. This pitch was about E5. By the time I reached the belay below the crux 6th pitch through the great arch, the breeze was chilling me, and I could see the colour of the gniess turning before my eyes from a that familiar flat grey of dampness to the crisp white of dryness; and friction. It’s been a wee while since I’ve had that great feeling of ‘now is the time to go for it’. Simultaneously feeling a little queasy in the stomach, and anxious to release the physical energy and adrenaline which is bursting to get out. The next thing I knew I was 10 metres up the pitch, leaning back with my hands off with double knee bars behind a huge undercut in the most outrageous position. The first crux was right above. A full stretch reach from the undercut to a tiny crimp and then a boulder problem to get to the break at the back of the arch itself. In the space of ten minutes I’d gone from a bag of nerves with a stomach full of butterflies, to feeling totally relaxed and just eager to go for it. So the first crux felt easy. Unsurprisingly, the transition to completely horizontal roof climbing felt a bit of a shock to the system, and I fumbled with two cams, and then decided not to even bother with the third. I was getting too pumped. I got really excited about the next seconds as I’d find out whether I had enough power to do the crux, or fling myself into the huge space below and test the cams and wires in the creaky roof flake. So I realised I better move it before excitement turned to nerves. What followed was a classic climbing moment of a blur of slapping hands, quickly made up sequences on the hop when I did it all wrong, and a bit of aggression. In no time I found myself stood above the lip, panting to catch my breath. 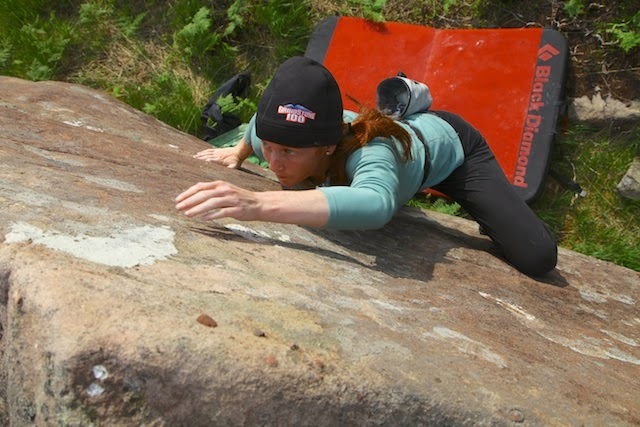 The great thing about roof climbs is once you get over the lip, it’s usually over and you know it. All that was left was to fully soak up the spacey atmosphere as I abseiled back down to strip the roof and dangle around on the rope waxing about the route just climbed as the sun finally sunk into the sea. After a 1am dinner of curry, rice pudding and cups of tea at the tents, the rain started. 36 hours or storm later, the back of the great arch had become a waterfall which would have taken days to dry out, and we got on an early boat home. On the ferry back from Barra, we were suitably inspired to seek out some more obvious great lines to point ourselves at in the Hebrides in the not too distant future. A good start to the summer, which has come seriously late in the highlands this year. Well happy abseiling back down to strip the runners from the roof. A still happy rock climber abbing in to do Prophesy of Drowning, E2, just before getting the boat home. If you climb E2, you must do this route. Smiles are a running theme for rock climbers on Pabbay. It’s pretty good! Do you need any more convincing that Prophesy of Drowning is a very very good E2? 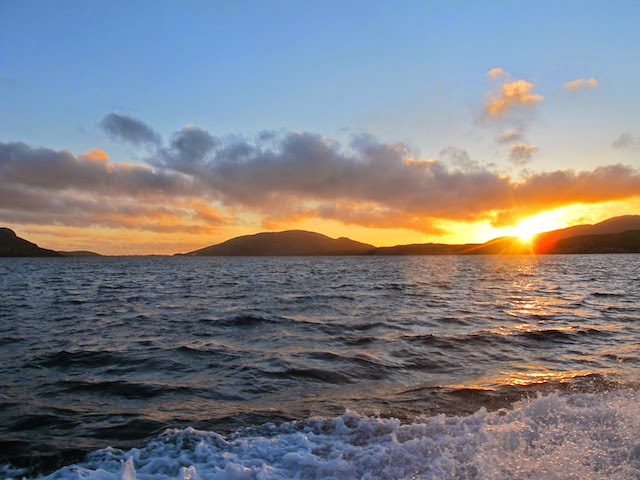 Hebridean sunsets on the ferry home. A good moment to dream up new climbing plans.